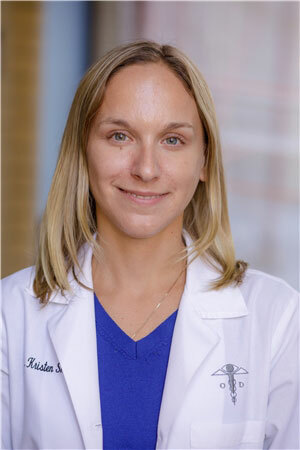 Dr. Kristen Saggese, also known as Dr. Kristen Shibley, has extensive experience fitting contact lenses and was the lead member of the #1 fitting practice of daily disposable multifocal lenses in the United States for four years. Much of her success in this area comes from her attention to detail and caring attitude. A proper contact lens fitting starts with learning about a patient’s daily activities. She has training in the diagnosis and treatment of eye disease, including dry eye which also plays a large role in successful contact lens wear. She prides herself on staying up to date with the latest advancements in eye care allowing her to provide her patients with the best quality of care. Dr. Saggese received her undergraduate degree in Biology from the University of Delaware, during her time there she participated in a study abroad program in Siena, Italy where she met her husband. She received her doctorate of optometry at the SUNY College of Optometry in 2010 and finished at the top of her class. She continues to attend numerous continuing education lectures throughout the year to stay at the top of her field. Dr. Saggese is originally from upstate New York but has lived in the Kips Bay area for over 10 years. In her free time, she loves to travel, listen to live music and watch NY sports.